Vern's Airback Series VI from the Shigegru factory in Japan is among the finest shears we have seen. Its advanced design combined with the outstanding craftmanship and finish work make this the shear to own for those advanced stylists who seek the best. 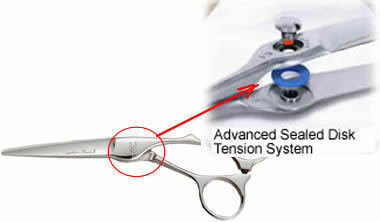 Advanced disk tension system reduces friction to near zero. Combined with the finest super cobalt steel alloys, allows for effortless cutting. Very similar to Airback III but less of a crane offset handle, nearly neutral finger position. Available 5.8 inch and 6.2 inch. 5.8 inch shown. Performance is excellent. Highly recommended!